Blogging changed web publishing industry. The change was revolutionary as it allowed every reader to become publisher. One of the important aspects of blogging is to connect to other bloggers and link to other relevant articles. This linking helps the linking blogger to provide more value to readers. It would also be useful to the readers of linked blog to be able to see how the article is discussed in other blogs. Trackback functionality aims to achieve this. Trackback is a way for Web publishers/Bloggers to request notification when somebody links to them. Most of the blogging software support Trackback functionality. All the trackbacks can be shown on the originating article, giving readers more engaging experience by showing related discussions. What if my Blogging/Publishing platform does not support Trackbacks? One such example is Blogger. If your platform does not support trackbacks, check if it has a similar method. Blogger, for example, shows backlinks, which is similar to trackbacks. But Backlinks relies on Blog search feature, so sites linking to the blog must be indexed. That’s why there might be delay before links are shown. Alternatively, you can sign up with external services. You can use Haloscan with Blogger. Haloscan have easy to use implementation for Blogger. But Haloscan will update your HTML layout and care should be taken every time you edit HTML. Backup your original layout before implementing the functionality. When you link to a trackback enabled article, you need to ping the originating article. Most blogging software automatically supports pinging to all the links in a published article. However, if your platform does not support it (Blogger does not support it), you can use external services. Haloscan provides such service. 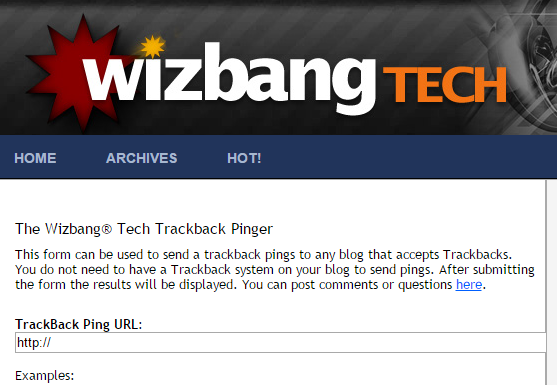 http://tech.wizbangblog.com/ping.php is another pinging service you can use. You do not need to sign up to use the service. Pest management is an important problem to check out if you lease or rent. what the existing pest management insurance policies are. I'll be grateful when you proceed this in future. Numerous other folks can be benefited out of your writing. Cheers!